We are a part of the Calgary Real Estate Community and are proud Calgarians and Albertans. 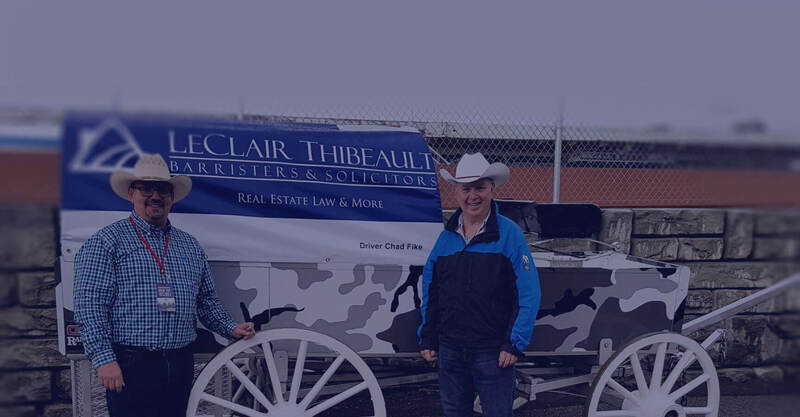 Not only do we provide Calgary and Calgarians with Real Estate Law, Wills and Estates Law, Foreclosure Defence Law, Corporate Law services but we also are proud supporters of the Annual Calgary Stampede. LeClair Thibeault also known as Calgary Law also supports the Calgary Community through various local charity events. RESPONSIVE SERVICE. EXPERT ADVICE. BULLETPROOF CONTRACTS. LeClair Thibeault is Calgary’s leading law firm specializing in real estate law for both residential and commercial clients. Our headquarters is in Calgary, Alberta. Our other focus areas include estate planning, corporate law, and foreclosure defence. When you need your property law matters resolved correctly the first time, call the offices of LeClair Thibeault. Welcome to LeClair Thibeault, Calgary’s preeminent brand in legal services. We are located in Calgary, Alberta and provide services throughout Alberta in a number of areas. Our Lawyers and staff are providing legal services in the areas of Real Estate, Corporate Relocations, Mortgages and Refinancing, Wills and Estate Planning, Commercial Lending and Asset Protection, Foreclosure Defence, Foreclosure Services and Litigation. When it comes to protecting your real estate, experience is an invaluable asset. We are the preeminent Real Estate law firm in Calgary Alberta. There’s more to structuring a mortgage than just getting a low-interest rate. We’ll ensure tax efficiency, minimize hidden fees, and protect your Real Estate rights. We also structure transactions to ensure that you increase your gains and minimize your risks. You need the right team behind you for support. Go with the experts. A foreclosure notice isn’t the end. LeClair Thibeault will fight for your rights. We’ll minimize damage to your credit, help you to either remain in the property or find a new home, and defend your assets from seizure. Don’t let the banks dictate terms to you. You don’t have to fight foreclosure alone: we’ll stand with you. Alberta’s leading financial institutions trust LeClair Thibeault above most other area law firms. Our commercial law group focuses include business sales and purchases, commercial purchases, refinancings, secondary lending and more. When your business is on the line, get it right the first time. Done Now. Done Right.® is more than just a trademark – it's our minimum standard for legal service. We provide fast, effective, and creative solutions to our clients. At LeClair Thibeault Barristers and Solicitors, we combine 40+ years of experience into one firm. We have the confidence and expertise to handle your most complex legal issues relating to real estate, business law, estates, and more. We simplify complex matters so that you can understand them. When you have questions, we provide quick responses. When you have legal difficulties, we make them go away. Our standard of work is easy to express: Done Now. Done Right. ® You shouldn’t have to wait for exceptional service. We believe that nothing is more expensive for a client than a poorly handled legal matter. A badly-worded mortgage agreement can be incredibly expensive, even if it was ‘cheap’ to have it drafted. At LeClair Thibeault, we make sure that your deals are structured to be in your best interest. Hire a Calgary law firm you can trust will get it “Done Now. Done Right.®” Stop worrying about an endless tangle over legal issues further down the road. We have decades of practical experience handling major commercial and personal transactions in Calgary and throughout Alberta. We have the experience, the knowledge, and the contacts to help you, your business, and your family to understand all the complex Canadian property law issues related to real estate, wills, estate planning, estate administration, foreclosure defense, commercial sales, litigation support and even family law. If it involves protecting your assets, securing loan agreements structured to your best interest, and efficiently transferring property, our experts will make it right for you the first time. When you have a legal problem, you need knowledgeable lawyers to address it correctly and quickly. When you have legal problems, you need more than explanations: you need rapid legal solutions. We have an excellent reputation among Canadian law firms and Calgary law firms for our ability to analyze problems and come to quick resolutions to the benefit of our clients. We are a results-oriented firm. Unlike other firms that treat retainer agreements as a way to bill more hours, we are more focused on finding more solutions per hour. We do the work that you need when you need it done. We tailor our work to the client rather than trying to match cookie-cutter solutions to your unique needs. Did you know that approximately 75% of issues on Real Estate files result from Real Property Report Issues? Find out critical historical information about any property you want to acquire or sell with full property reports. Did you know that the vast majority of people don’t have wills prepared or up to date? At LeClair Thibeault, estate planning is one of our specialties. We’ll prepare a will for you and keep it updated. Don’t fight foreclosure alone. We will help you to resolve your foreclosure quickly. Whether you want to remain in the property or sell it, we’ll protect your credit, negotiate on your behalf, help you to get a modified loan agreement, and more. The bank has a commercial lawyer fighting for its institutional interests. Who’s working for yours? Make sure that you secure the best terms possible on business loans with help from LeClair Thibeault. LeClair Thibeault is a Calgary based property law firm with over 40+ combined years of experience in areas like real estate, corporate law, and estate planning. When handling complex property law issues, you can’t afford to miss the important details. Personalized advice. Fast responses. Trusted experts. Durable contracts. Structure your deals to serve your interests. Few things can be more expensive than a bad contract. Our experts will improve your financial savvy. Unlike other law firms, we live up to our slogan: Done Now. Done Right.® We’re not an assembly line law firm. We provide real personalized expertise on property law, commercial law, wills estates and more. We’ll make the law work for you rather than against your interests. Especially when negotiating complex agreements, you need legal experts on your team at the right time: now. A bad contract is like a ticking time bomb. LeClair Thibeault will identify risky clauses in contracts so that they don’t blow up in your face later. We defuse the problems to protect your interests. Client education is a top priority for LeClair Thibeault. Read our articles to learn more about our practice areas. Includes helpful tips on how to structure mortgages, plan your will, phrase shareholder agreements, and more. Bill LeClair and Ron Thibeault founded LeClair Thibeault in 2001. Our initial focus was in commercial and residential real estate law. Since then, we have expanded our areas of practice to include estate law, corporate law, and family law. The firm has over 15 support staff members and is growing.